Super Bowl Sunday is usually a double-sporting event for me. Just finished watching the Australian Open Tennis Championships: Novak Djokovic is starting to own Melbourne Park the way Rafael Nadal is Rolling Garros reigning monarch. Congrats to Novak, and to finalist Andy Murray. Their display was dynamic, especially those first two sets. Later in the day, of course, is the crowning glory of the NFL’s season. All the best to the Seahawks and Patriots—and to Aaron Rodgers, the NFL’s repeat MVP (another personal favorite of mine–the guy seems a class-act :)). Before I was actually into “the big game,” I always looked for a party. (What’s better than one more excuse to chow down on junk food while hanging out with folks you like?) Since the NY Giants’ crazy run to the championship game in 2011, I decided I wanted to stay home so I could better focus on the action. My kids planned to have a few friends over that night, and a friend of mine showed up as a surprise. I threw together a few pizzas—maybe tacos too—slapped snacks and drinks onto the table and baked a football-shaped brownie. 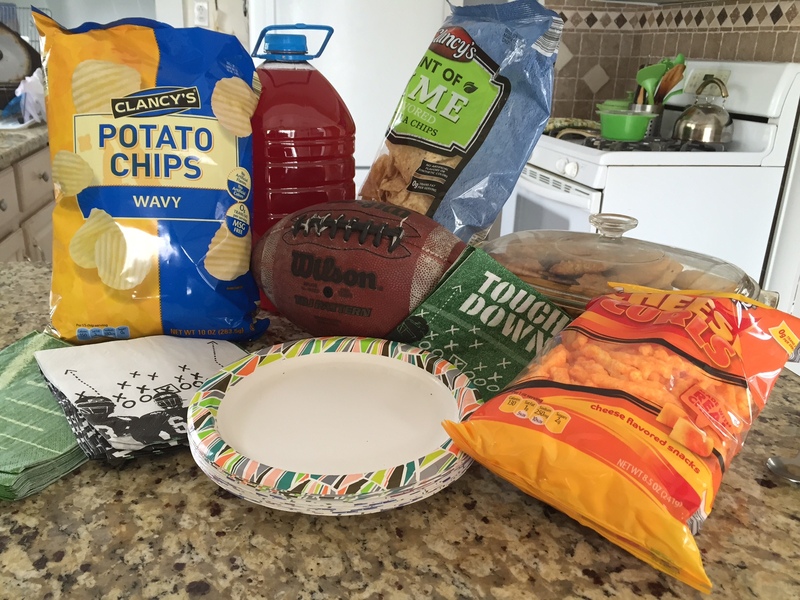 Some football-themed paper goods rounded it all out and our Super Bowl tradition was born. So, do you celebrate the Super Bowl? Are you a party person or do you prefer to be in front of your own big-screen so you don’t miss a play? Do you wish the hype would just go away? Any votes for Super Bowl SATURDAY? (Hear, hear!) Should the US declare Monday after the Super Bowl a national holiday? No game day for me either. I’m hoping for a quiet day to get some dusting and cleaning done and then r.e.a.d.i.n.g. Sundays are supposed to be my ‘down’ days. Haven’t had many lately. Game was great, with no major disappointment for me since I’m not necessarily a fan of either team. Rough ending for the Seahawks, but it was fun watching with my family. Snow day already called for Monday, so I’m hoping for a computer-productive day. Hope you enjoyed your Sunday, Tess! I did. The cats and I cuddled together. Yes, all at the same time. Just got a new one a week Saturday and Lady G. accept him. Watched a couple movies and read. Today we’re all snowed in. The city is shutdown. No school. No work. No newspaper or snowplows yet. How’s your snow situation?